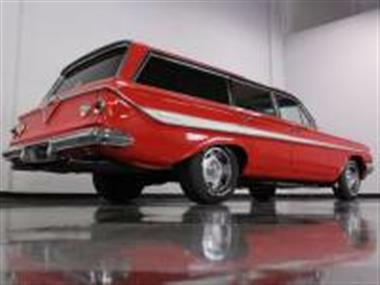 1961 Chevrolet Nomad in Fort Worth, TX for sale. 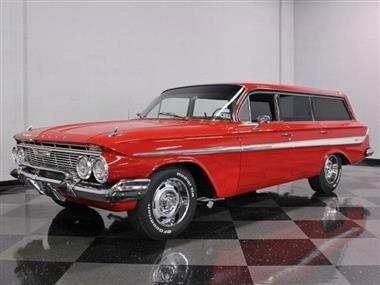 Wagons remain red-hotand#44; and few are redder or hotter than this 1961 Chevrolet Nomad. 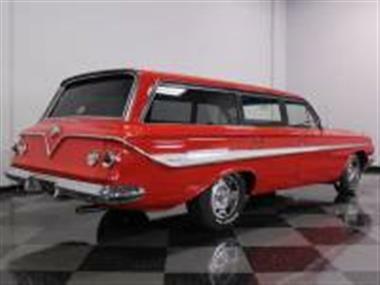 A famous name on an equally appealing haulerand#44; this Nomad offers a host of upgrades to make it a great cruiser without losing that vintage feel that will take you back to your childhood touring the countryside in your familys station wagon.<br /> <br /> 1961 Chevys are pretty conservative but theres no denying that a bright red station wagon makes a statement. 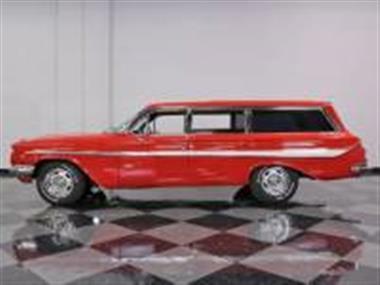 The brilliant Roman Red finish was correct for 1961 and the wagon wears it welland#44; with very straight sheetmetal that doesnt look like it was neglected and abused like so many other station wagons of the period. There are five doors to make fitand#44; but it looks like they spent the time to get them all rightand#44; which is especially critical with the spear-shaped side trim streaking across the flanks. Details like the dogleg-shaped A-pillarand#44; small chrome ornaments atop the fendersand#44; and the V-shaped trim on the tailgate are instantly recognizable Chevy trademarksand#44; all of which are very nicely done. 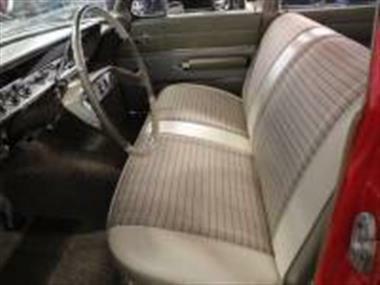 The chrome and stainless was likely refinished when the rest of the car was restoredand#44; giving it a very crispand#44; finished look that doesnt stray too far from the factory recipe.<br /> <br /> The interior was completely restored using tan fabric inserts on the original bench seatsand#44; effectively updating it without changing its personality in any significant way. New door panels were used that match the vinyl portions of the seats and there are new dark brown carpets on the floors for some contrast. The gorgeous two-tone steering wheel looks original and frames an instrument panel thats the best of early 60s designand#44; with chrome and stainless trim but no fake wood to be seen anywhere. Youll note that this car carries ultra-rare factory A/Cand#44; which is functional but perhaps in need of a top-off of R12. The original AM radio is still in the dashand#44; but given the road-trip possibilities of a car like thisand#44; its been fitted with a modern AM/FM/iPod stereo in a box under the dash. The back seat is in excellent condition and the cargo bay is not only cavernousand#44; but beautifully finished in matching materials to give this wagon a very polished look. The window felts are new and the glass is tinted for a semi-custom look.<br /> <br /> Thanks to the wonders of the small block Chevy V8and#44; there are now 350 cubic inches living under the hoodand#44; yet the look is pure 1961. 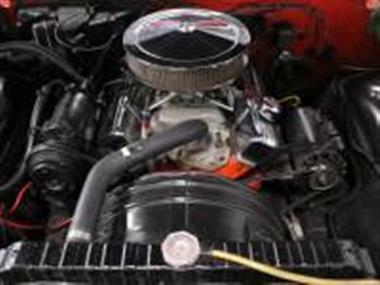 Performance enhancements include a Weiand intake with a Holley 4-barreland#44; an upgraded camshaftand#44; along with the requisite dual exhaust with glasspack-style mufflersand#44; while its dressed up with chrome valve covers and air cleaner. Original parts like the A/C compressor and generator give it an authentic lookand#44; and with Chevy Orange paint nobody will mistake this for anything else. 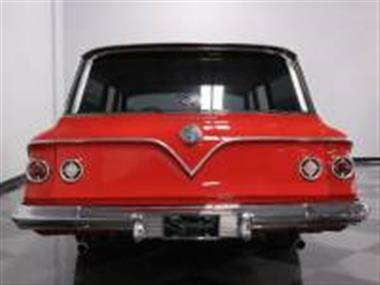 The original PowerGlide was dumped in favor of a 3-speed TH350 automatic which is a better choice for todays traffic. Power steering is another welcome option and it sits on handsome Rally wheels and staggered 215/70/15 front and 235/70/15 rear BFGoodrich T/A radials.<br /> <br /> Join the wagon movement and find out just why these cars are more popular with each passing year. 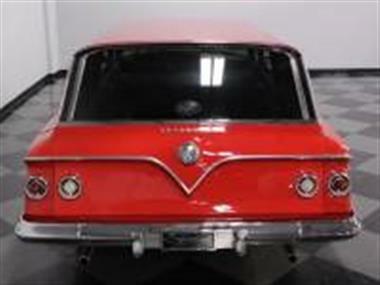 Beautifully finished and ready to goand#44; this Nomad delivers on the promise of first-class road trips. Call today!